Dry eye, corneal abrasions, infections and malformations can be very painful and may cause serious long term damage to your vision. It is exceedingly important for your eye doctor in Humble, TX to be able to offer the best and most advanced treatment in reversing the damage done by these all-too-common conditions. 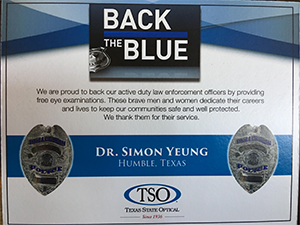 Dr. Simon Yeung, OD understands this, which is why he strives to provide his patients with the best and most advanced eye care available today, including being one of very few optometrists in her area to offer BioD Optix, a revolutionary new technology that utilizes the amazing healing power of embryonic tissue to heal dry eye, corneal abrasions, infections and other potentially damaging and painful corneal conditions.